Capitol Update – A second hurdle for HB 703 on Wednesday April 30! Things move fast at the Capitol during the legislative session. HB 703 was set for a floor vote today — and now it’s up in the air – probably to settle back down for a rescheduled floor vote on Wednesday April 30th. This is a must-win bill. It’s going to be close. Representative John Bel Edwards’ HB 703 barely passed out of the House Education Committee by a vote of eight to seven. It must make it through step two: a vote of the full House. Promoters of national for-profit charter school chains see as essential the state-level override authority to push budget-breaking charter schools onto A, B and C school districts. High-performing districts know the score and do not want these schools. They do not want BESE to have the authority to override taxpayer consent. We must work for every single vote on this bill. Each vote of the Acadiana delegation and the New Orleans democrats is a must have. Please use www.legis.com to locate the Representatives by parish. Call early! Call often! Email, snail-mail, and fax. Monday, Tuesday and Wednesday. You can be assured that the for-profit charter school lobby and the business lobby will be out in force to oppose this bill. CABL, LABI, and the Louisiana Association of Public Charter Schools tout their 100% record of defeating any real reform that threatens the roll-out of the corporate business model of education. They will fight to preserve that record and to ensure the unchecked spread of the for-profit corporate charter school chains. Those who value an integrated, effective, and equitable public school system that welcomes all students – regardless of parental support, economic condition, disability, or English-language status, need to fight as hard as those who want to divide our public system into ‘winners’ and ‘losers’. The lobbyists are well-paid. But we have cell phones and heart. HB 703 does not stop, close, or harm existing or authorized charters schools, or stop new schools from going to willing districts. HB 703 impacts only Type 1 applications to A, B, or C districts that reject the applicants because the charter model does not fit into the district plan for success. HB 703 rewards high-performing districts and protects their ability to retain and improve their high rating. If a district slips to a C, D or F rating, BESE can authorize Type 2 charters directly into the parish, since C, D, and F is defined as failing. This supports the original intent of the charter school movement: to deliver innovation for at-risk students in failing schools. State law requires that local school boards determine the number and location of schoolhouses. HB 703 guarantees this legal provision for A, B and C districts. We can’t take HB 703’s success on the House floor for granted. The time is now, and together we can win that vote! Are the Common Core State Standards and accompanying PARCC tests the vanguard for the corporate takeover of public education? Joshua Bleiberg in “Four reasons that critics of Common Core should reconsider their opposition” confirms connections exist between multiple aspects of today’s failed corporate education reforms and support for Common Core. The following are four reasons to reject Bleiberg’s argument and to consider opposing Common Core and PARCC testing. 1) Big data is coming. “Standards will improve how big data works” is suggested by Bleiberg as a reason to support Common Core. Parents don’t want big data to work on or anywhere near their children. Promoting ‘”big data” as a Common Core feature not a bug, shows a stunning lack of awareness or respect for parents’ concerns. Bleiberg writes, “National standards also make it easier to link databases from separate states and districts together, which enables larger data sets.” Large data sets are not necessarily better-used or more valid data sets. States are awash in data today, to little good effect. Accountability and evaluation systems based on a single high-stakes test such as PARCC are invalid indicators of student learning or teacher effectiveness. 2) Market efficiencies enrich corporations. Bleiberg states “Standards also lower the barriers for new companies to develop programs.” In practice the exact opposite is unfolding. CCSS is consolidating curriculum and testing materials. Vast profits will be made by the Common Core curriculum dealers and PARCC testing companies who got in on the ground floor. Benefits to “new companies”? Doubtful. 3) Market efficiencies grow for-profit charter schools. Bleiberg writes “Developers can create a single tool for a national market rather then many tools for every set of standards.” Bleiberg obliquely acknowledges that states have existing standards – but 50 sets of state standards do not provide adequate business opportunities to corporate profit-seekers. CCSS allows charter schools to experience huge efficiencies, allowing them to purchase just one curricula for their multi-state business enterprises, enhancing their business model, which is simply making profits from taxpayer money – money that should got to educating children. 4) New ‘governance’ gets rid of school boards and direct accountability. Bleiberg uses a new buzzword promoted by Reed Hastings, CEO of Netflix and Rocketship charter schools: governance. The word ‘governance’ is used by the corporate reformers to promote the removal of local elected school boards. Local governments know their constituents’ needs and are nimble enough to act. Corporatizers prefer appointed boards and unaccountable not-for-profit charter school boards. Hastings has set a national goal of 90% of students enrolled in charter schools by 2030. Elected school boards are seen as a hindrance to the speedy implementation of corporate takeover. Elected local school boards listen to parents, educators and citizens who are becoming increasingly alarmed by the convergence of corporate interests to ‘create efficiencies’ to capture profit from public education. High education standards are essential to equitable and effective education, but must it be Common Core standards? Bleiberg’s article serves as a warning that the alarm bells ringing over CCSS and PARCC are justified on all fronts: big data, corporate enrichment, for-profit charter schools and governance. 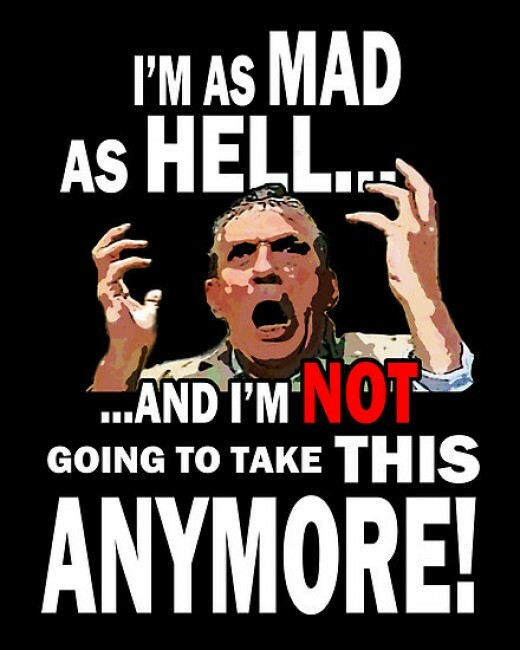 I’m mad as hell, and I’m not going to take this anymore! VP Barras is a veteran teacher at Lafayette High School. Frankly, that’s me right now, and here’s why. On March 27th, the Greater Lafayette Chamber of Commerce listed its priorities for the legislative session, and among them is its support for Common Core. If I were to write a manual telling doctors how to operate, people would laugh and doctors would rightfully ignore me. I have not attended medical school nor received the training a doctor needs. Yet organization after organization with little or no educational background thinks they are experts on education. The Council for a Better Louisiana, Stand for Children Louisiana, and the Louisiana Association for Business and Industry, just to name a few, have all published their support for Common Core. Apparently, merely having attended school or college—or simply having a child—affords everyone a seat at the table to determine the future of education. Worse, everyone listens to these organizations and not the teachers themselves. I am a highly-qualified teacher with two Bachelor’s degrees and a Masters in History. I was chosen the Outstanding Sophomore, Junior, and Senior in UL’s College of Education, not to mention the Outstanding Graduate of its 1992 Spring Commencement. I have experience writing curricula and have taught Algebra I and II for twenty-three years, as well as numerous history and English classes. I am an expert on education, not these various groups. To every organization that announces their support of Common Core, I have a right to explore your qualifications and biases. Have you received money from Bill Gates or any of his organizations? Are you teachers who have implemented the Engage New York curricula that was designed to match Common Core? Have you actually read the poorly-written modules we teachers have received or taken one of their confusing tests? Are you experts in the cognitive abilities of young children and adolescents? I suspect the answers to these questions are a resounding NO. And I have upsetting news for these organizations who don’t even bother to explore what is in Common Core: the people who wrote it weren’t experts either. The twenty-seven authors were mostly test-makers, and none were teachers. Why should I give their handiwork any credibility when they lack the credentials to even be classroom teachers? So, should any new organization wish to herald the need for Common Core, I have these words of advice: unless you’re qualified to speak on the subject, mind your own business. Otherwise, I will accord your opinion the weight it deserves: little.